The "self-proclaimed governor" of Donetsk region Pavel Gubarev has been detained in Donetsk, the Security Service of Ukraine (SBU) has reported. "Employees of the Security Service of Ukraine (SBU), with the assistance of Alpha [special police], have detained Gubarev in his apartment in Donetsk under a court ruling," the SBU's press center told Interfax-Ukraine. 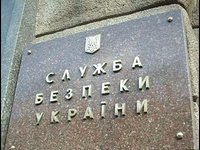 According to SBU, Gubarev was charged with committing crimes under Part 2, Article 110 (encroachment on the territorial integrity and inviolability of Ukraine), Part 1, Article 109 (actions aimed at the forcible change or overthrow of the constitutional order, or the seizure of state power) and Article 341 (seizure of state or public buildings or structures) of the Criminal Code of Ukraine. As reported, pro-Russian protesters seized several times the building of Donetsk Regional State Administration under the leadership of Gubarev. During one of the seizures Gubarev put forward a number of demands to the local authorities, including the holding of a referendum on the status of the region. In this regard, law enforcement agencies in Donetsk region are investigating a case on the seizure and attempts to seize the regional administration building, and these actions have been qualified as an attempt to change the constitutional order and state power.